Let’s just get down to the nitty gritty. Is a flat, fried corn tortilla a tostada or a chalupa? A tostada is a toasted/fried flat or bowl shaped tortilla (usually made from corn) with toppings on it. A chalupa is the shallow bowl tostada (unless you are going through the Taco Bell line in which case a chalupa is a soft-dough thick fried flour tortilla folded into “boat” form. I wanted to clear that up before any fights ensued. Granted, apparently these terms vary by location, so it might be different where you live and eat! Either way, my husband made me the most amazing tostada/chalupa today for lunch! I baked and fried some corn tortillas for tostadas the other day for the fam (which were also super yummy) and we had two left, so my hubs made up his own invention and I. loved. it. 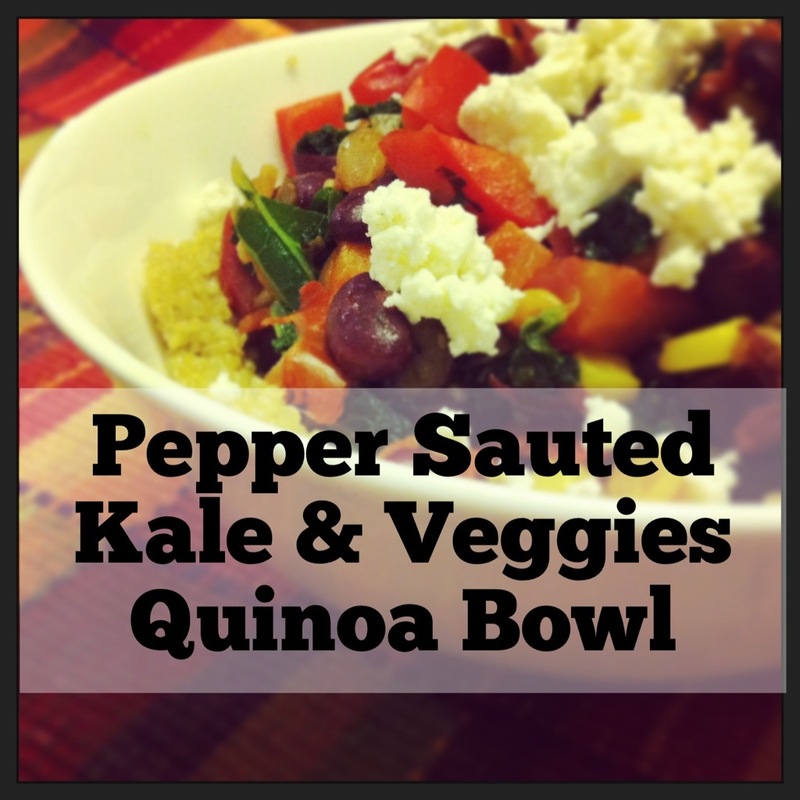 In a small bowl, mix together hummus, feta (saving a few pieces for topping), and kale. Spread it over the tostadas. Top with a few more pieces of feta and the tomatoes. I know it’s simple, and didn’t really need a “recipe” but it was just so yummy and so something I’d never thought about that I had to share! Props to my love, Mr. Chord Dice, for making me lunch! I wasn’t even going to post today but it was so yummy I had to share! Lay them flat on the oven rack at 250° for 7 minutes (keep an eye on them and take them out earlier if they are too brown). With a pair of tongs, lay the tortilla into the oil for about 20-30 seconds using the tongs to push it down into the oil, then flip it over and fry it for an additional 20 seconds. Lift the tortilla out of the pan allowing the oil to drip off and place the tortilla on a towel-lined plate (or, if you are green like me, put it on a cooling rack with a cookie sheet underneath it so that the oil just drips onto the cookie sheet). Finish with the rest of the tortillas! And because I am the queen of selfies, I had to take one with my tostada/chalupa! Haha! Okay, so admittedly, this recipe was born solely from the fact that my husband was bugging me to use the big ol load of kale I got at the store on Monday and had yet to cook. So, I did a little once over of what we had in the fridge and then mentally recalled my Pepper Sautéed Kale & Veggies Quinoa Bowl and just went for it (although I was totally not in a cumin mood, so I changed this one up to be more Italian). Okay, sorry for that tangent. A little tip: As you chop and slice, combine ingredients that will go in the pan at the same time into the same prep-bowl. Bowl 1: carrots and tomatoes. Bowl 2: squash, zucchini, green onions. Bowl 3: mushrooms. Bowl 4: kale. Cook the quinoa if you have yet to do so. Heat a pan with the olive oil and saute the garlic for a minute or two then add in the Ana’s Herbs and allow to saute for several more minutes (this sorta “reactivates” the dried herbs). Add more oil to keep the herbs from burning if necessary. Add in the fire roasted diced tomatoes, mix together with herbs and let cook for three minutes. Add in the carrots and tomatoes and let them cook for three minutes. Add in the mushrooms and let them cook for… yep, three minutes! When you add in the mushrooms, pour the kale into the hot water and allow it to blanch while the mushrooms cook. No longer than three minutes! When the mushrooms are finished move the pan off of the heat, strain the kale, and combine it with the veggie mixture in the pan. Serve it over the quinoa as soon as you can because kale is at it’s best (and prettiest) when it is still bright green! For the record: my husband said “Wow this is gooooood.” at least 7 times, which is the biblical number of perfection, so I’m going to deem this recipe a success! So, I decided to get cuh.raz.y. 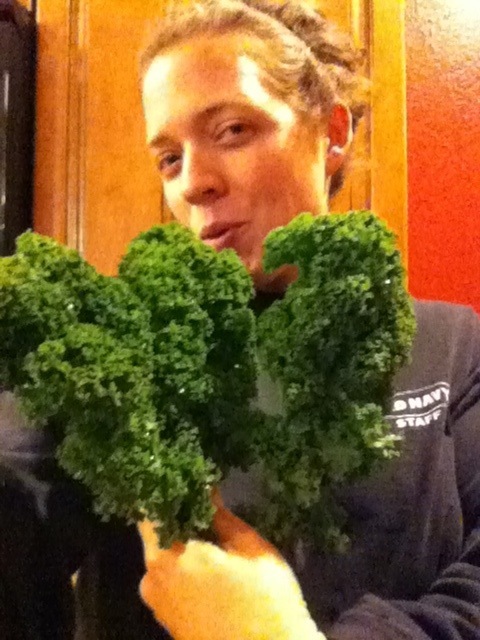 tonight and try to make something with the huge load of kale he bought at Market Street the other day. If you haven’t already chopped your veggies, do that first… chop: the kale, red bell pepper, mushrooms, and tomato. If you haven’t already cooked the quinoa, get that started as well. Get some water boiling, cause you are going to boil the kale in just a minute. Heat up a large skillet to medium-high and pour the oil in. Saute the garlic and onions until tender. Add in the bell pepper, mushrooms, corn, and water. Saute until tender-firm. While the veggies are sauteing, boil the kale for three minutes and then drain in a colander. 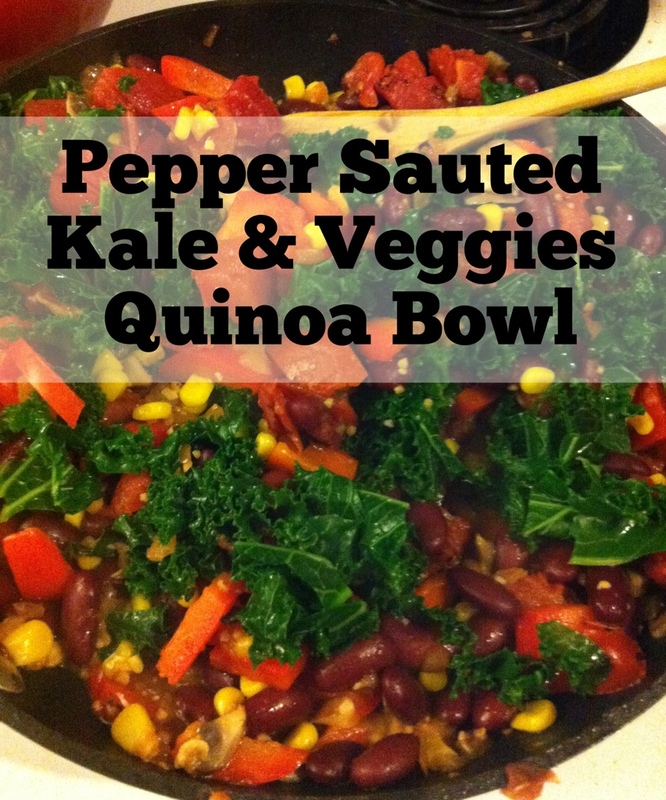 When the kale is finished and drained, add it as well as the tomato and beans and stir it all together. Sprinkle the cumin on as well as the Frank’s hot sauce and stir. Let it cook for two or three minutes. While the seasoning cooks in, place the quinoa in the bottom of the bowl, and then spoon in the sauteed veggie mixture. Sprinkle with feta, if desired, and enjoy!